When I first entered the audio engineering world, I asked questions like: “what is the best way to mic a (insert instrument here)?” Almost unanimously I was answered with “use your ear to find where it sounds good, and put a mic there.” While there are widely accepted patterns and rationales as to how any instrument should be recorded, there is no rule that supersedes context. Sometimes (read: more often than not) the place that sounds best is the least convenient location to put a microphone, usually for one of two reasons: either it’s too far, or too close. If the microphone needs to be close, there’s a likelihood it could get in the way of the player’s ability to move naturally on their instrument. 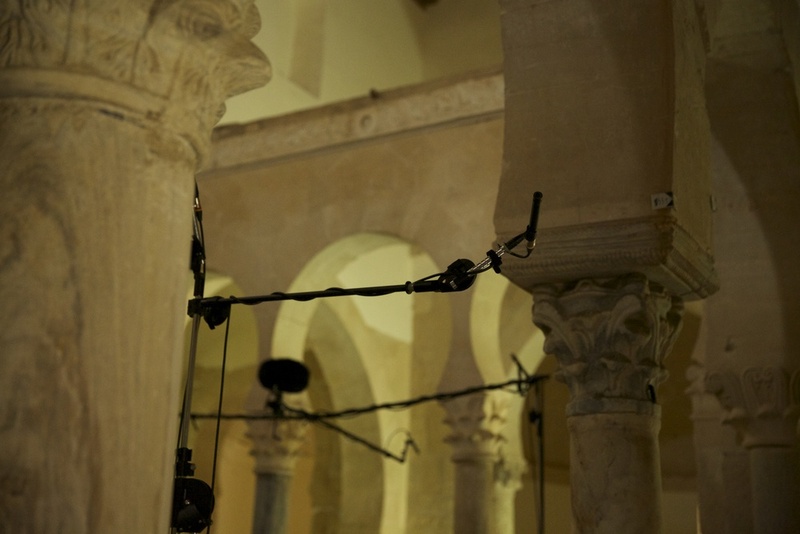 Too far, and mounting it up high creates problems of stability unless the venue has a wire system specifically for mounting mics (spoiler: most churches do not). On a project like this, you also have to take into consideration the presence a surround-recording rig will have on the venue. People enter these religious spaces for unobstructed peace, not to step over cables and navigate a maze of stands. For our needs specifically, we had to have something capable of placing mics up high and out of the way, without losing stability. I contacted Latch Lake because, not only are their stands known for stability, but the flat, round bases would fit more easily under and around pews that tripod stands. We were able to mount our entire seven-mic array consisting of a Decca tree, two omni surrounds, and two cardioid surrounds on four total stands, perfectly placed and out of the way in each hall. While it’s easy to take microphone stands as a given, anything that can cut down on setup time while simultaneously allowing for more precise mic placement will have an immense, positive effect on the session-flow, and final product.